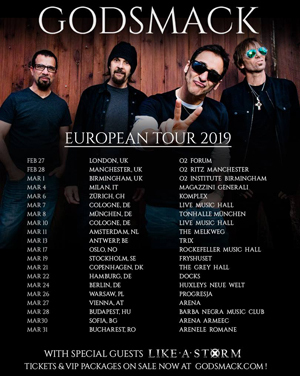 GODSMACK, the multi-platinum band who recently had to postpone their fall European tour due to the unexpected death of the son of guitarist Tony Rombola, have announced plans for a 20-date trek in 2019. The tour is set to kick off on February 27 in London with LIKE A STORM confirmed as direct support. Tickets are on sale now for all shows, including a second date at Live Music Hall in Germany recently added due to high demand. All tour dates listed below. Earlier this year (4/27), GODSMACK released WHEN LEGENDS RISE via BMG (US) and Spinefarm (Worldwide) marking the band's seventh studio album and their first in four years. The acclaimed 11-song collection, fueled by the Top 5 rock song and video "Bulletproof" plus the title track "When Legends Rise", entered the Billboard Top 200 album chart in the top ten (#8), with four #1 placements on other charts: Top Rock Albums, Top Hard Music Albums, Top Independent Albums and Top Alternative Albums. WHEN LEGENDS RISE is available on CD, LP and Digital; purchase or stream it HERE.